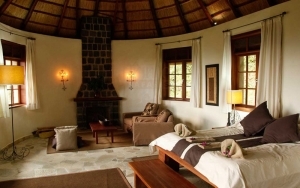 Where to Stay on Your Safari Around Virunga National Park? Lulimbi Tented Camp is located in the heart of Virunga and is home to a large percentage of the park’s elephants and hippos. 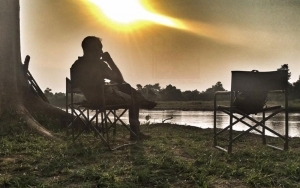 Buffalo, warthogs, giant forest hogs, topi, Ugandan Kob, crocodiles, and a wide variety of birdlife also abound.The Lulimbi Tented Camp is nestled into the shoreline of the Ishasha river, which winds through Virunga’s vast savanna plains. Mikeno lodge is one of the luxurious establishments that is a 90 minutes’ drive with spacious cottages that are enough and enable guests relax calmly and a good restaurant that serve local and international cuisines. The lodge and the restaurant are situated within a forest and offer attractive views of the rift valley, Nyiragongo and Mikeno volcanoes as well as abundance of birdlife, blue monkeys, chimpanzees, baboons and colobus monkeys. 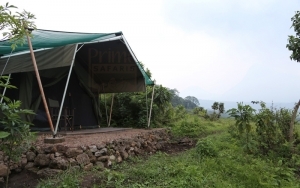 Bukima Tented Camp is just outside the Virunga National Park boundary lays the Bukima tented camp, which is one of the main starting points Virunga mountain gorilla treks. The camp was originally built for researchers, but is now used primarily by trekkers. 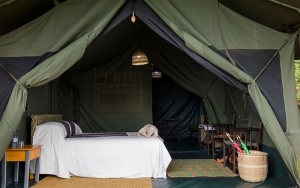 As the name suggests, overnight guests at Bukima sleep in platform tents, but by camping standards they are quite lush. Tchegera Island Camp is the perfect way to escape the hustle and bustle of Goma or to relax after climbing Nyiragongo volcano. Situated off the northern shore of Lake Kivu, Tchegera camp offers spectacular views of the lake and four volcanoes. On clear nights, Nyiragongo and Nyamuragira volcanoes add to the drama by turning the night sky red with their glowing lava. 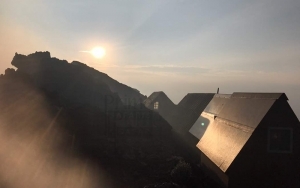 Nyiragongo volcano summit shelters offer accommodation that is very adventurous and worth experiencing since it enables one to enjoy the other side of nature. The summit shelters are located in Nyiragongo where visitors can spot a variety of wildlife species like the chimpanzees, bushbucks and monkeys. Kibumba Camp is an excellent choice for those seeking a more affordable way to experience the mountain gorillas in Virunga National Park. 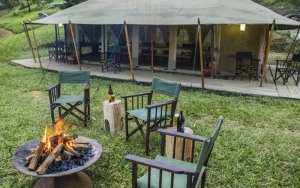 The camp is conveniently located near the trailhead for Nyiragongo volcano, which makes it the perfect place to stay for those wanting to experience both gorillas and the world’s largest lava lake.